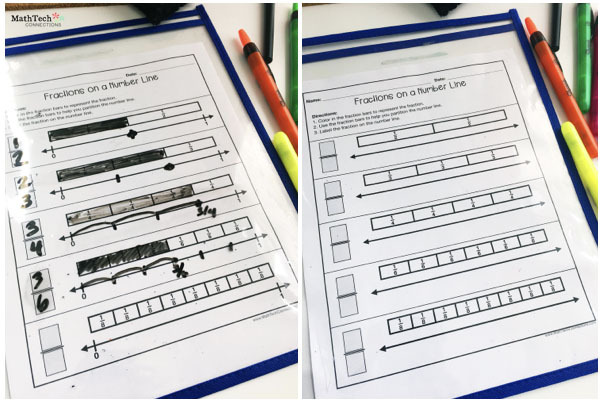 In this blog post I will go over the third grade common core math standards 3.NF.2 & 3.NF.3 and provide you with activities you can use with your students. These activities also work well for students who need remediation in 4th and 5th grade. I can partition a number line into halves, thirds, fourths, or sixths. 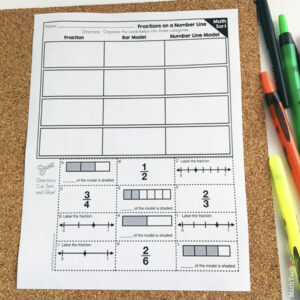 I can use models, number lines, and words to explain how fractions are equivalent. I can compare fractions by reasoning about their size. I can show whole numbers as fractions. Students tend to understand area models well. They can take a rectangle and partition it into thirds, fourths, and so on. They can use fraction bars to compare and explain why one-half is greater than one-fourth. 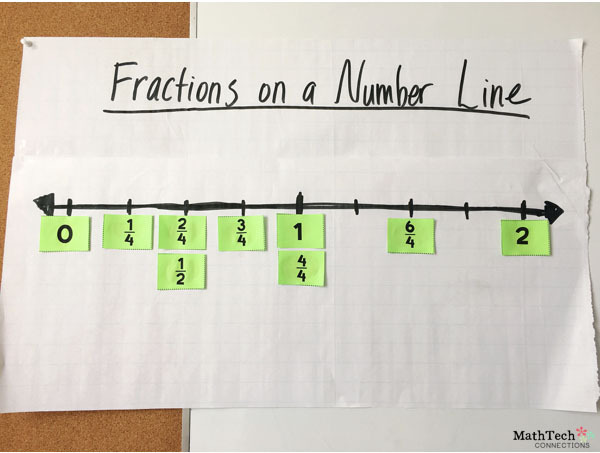 So, let’s use what students are comfortable with to introduce fractions a number line. In the above activity, students will shade a bar diagram to represent a fraction. They then use the bar diagram to help them partition the number line. Finally, they plot the fraction. You can choose to use this printable during small groups. There are three versions of this printable, so you can easily differentiate as needed. The first version has the fractions listed on the page. The second version has a spot for students to write a fraction. 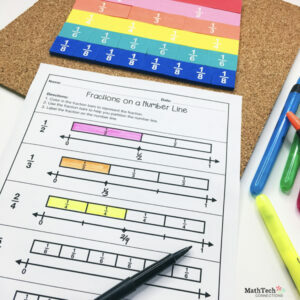 The third version is the most challenging, because students need to partition the number line and plot the fraction. Students enjoy working on math sorts. It’s always a win when you can teach a challenging topic in a fun way. This activity not only gets students cutting/pasting, but it also encourages students to explain their thinking. 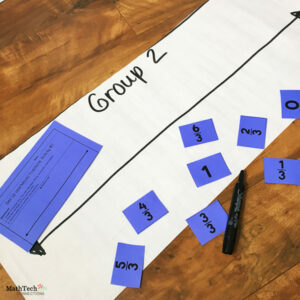 Organize your students into groups and have them create a large number line model. 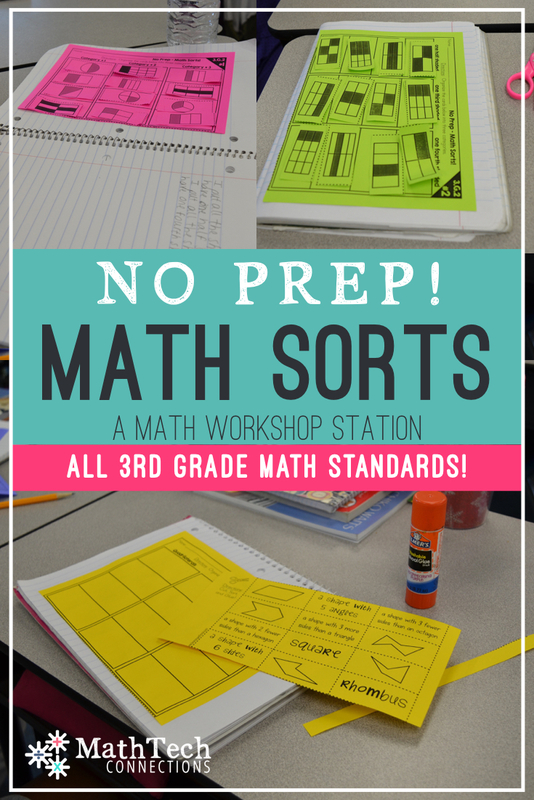 They can use chart paper, tape, string or anything else you may have in your classroom. The purpose is to get students moving and creating! I have typed up 5 different activity pages you can use with your students. They include a recording spot, so students can record what their number line looks like. Count the equal parts until you get to the first whole (one). Now let’s write the fraction greater than one as a mixed number. The above printable is included in the free download (at the end of this post). 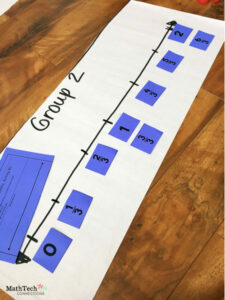 I also include a version that is perfect to use for during your guided math groups. The video below shows an example of how you can review this skill with struggling students. I start by showing my students what the final project looks like. They are immediately super interested and ready to get to work. It’s always a win when you can get students excited about a difficult topic. 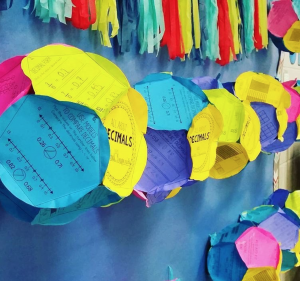 Below is an example of how one teacher displayed the final projects. 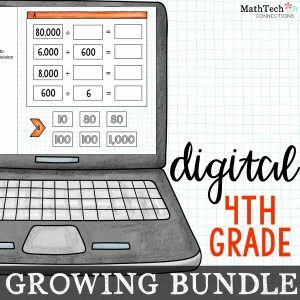 Engage students with these fun, interactive math centers. There are 2 practice files per standard. You could.. I hope you found the list of activities helpful. Complete the form to download the free resources. As a new to the math curriculum teacher this year, I TOTALLY appreciate your insight as well as your clear, concise activities for students to help them really understand numbers and math!!!!! 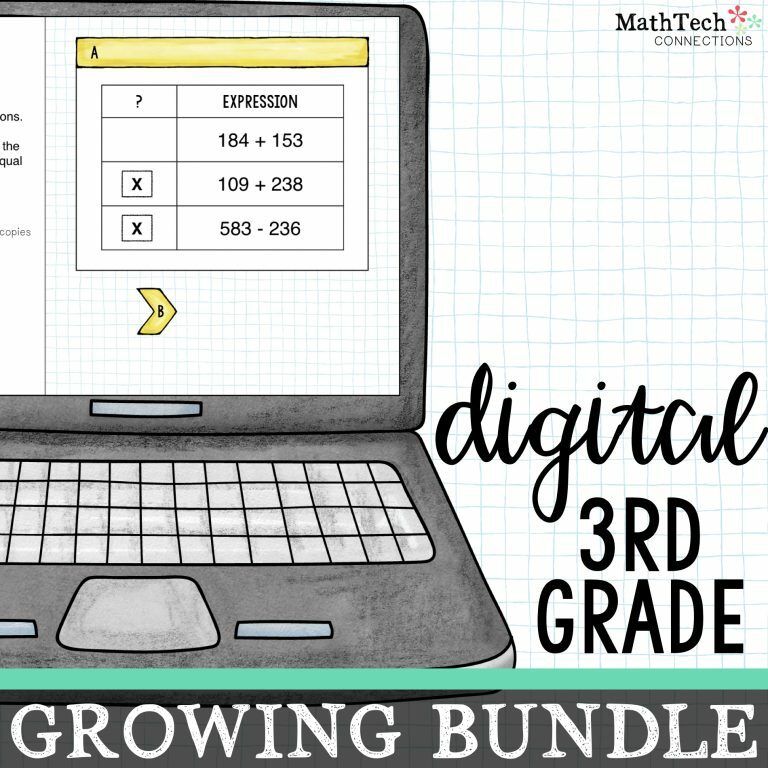 Thank you so much 🙂 I plan to continue digging deep into each math standard for grades 3-5! Hi. 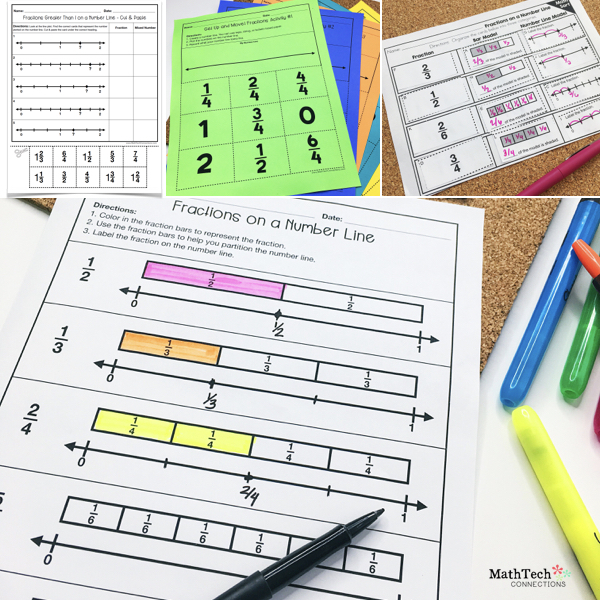 I can’t seem to download the free printables of the 6 activities to practice fractions on a number line. I already subscribed and confirmed the subscription. I just noticed where to download the printables. Sorry and thank you for the free printables. Hi! This is AMAZING but I can’t seem to download it! 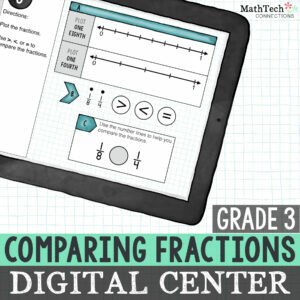 These fraction resources look great..unfortunately they are not downloading. Is there another way to access them? 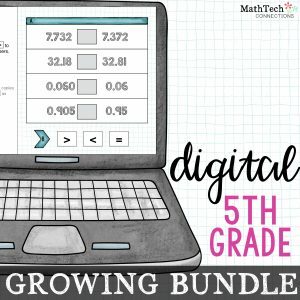 I would love to try these resources in my classroom but am unable to download them. I have subscribed several times. Is there another way to download them? You will receive an email that says subscribe & download your resource. Check your spam folder. You can also email me directly and i’ll send them to you. Would love to be able to download the resources. Did anyone figure it out? THANK YOU! 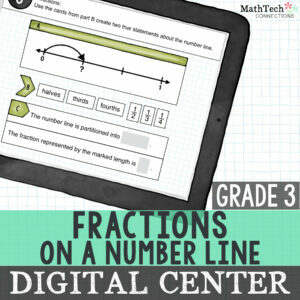 I have been looking all night for a resource JUST like this to teach fractions greater than one to my third graders. 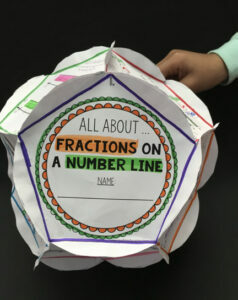 These activities look fantastic and I can’t wait to try them out with my kiddos. Thank you again! I love this and would love to download it, but I have to subscribe to get it and I already subscribe to your newsletters. 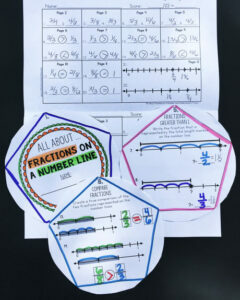 How can I get these fraction resources? Awesome resources to utilize in the classroom. So excited to try these ideas out. I subscribed several times, but did not recieve an email. Would love to try these resources. I successfully subscribed, but could not download anything. It said the connection timed out. Hey, I just updated everything. Please try again. I would like to download these materials. How do i get them? Would love to download resource! These sound wonderful. Is this how I get them? 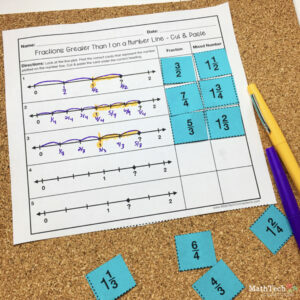 I would love to try out your fraction activities. I am unable to download the free resources and have not received the email with a password to access other resources. Hey, make sure you are signing up with a personal email address (not school). Also, check your spam folder. I have tried to subscribe multiple times and I haven’t received an email! Never mind, I found it under the ‘promotions’ tab in gmail! Thank you for letting me know. I’ve had other teachers with the same issue, so now I’ll point them in this direction.